I just watched your webinar and there wasn’t a “chat” box. Also, I not see your full face (only from your nose up!). 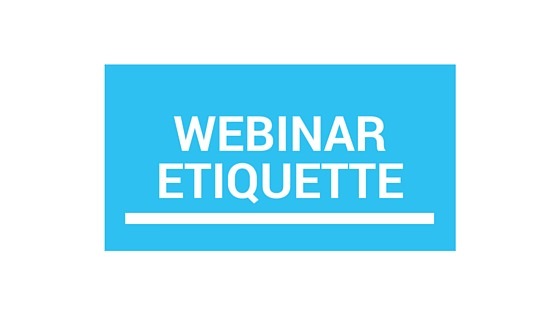 Good Webinar Etiquette should start with the Host asking all the participants if they can hear them okay, and see them okay. Not trying to be negative, just offer some of my personal opinions on how to host a webinar. The chat was open to a limited number of attendees due to a new update by the webinar service provider. Hello. I have just viewed this in preparation for the next webinar in November. I’m very glad that you addressed this issue, but I’m very sorry that you had some difficult experiences with this. This would be very helpful for those of us that have questions regarding the topic. They get lost with the other conversations, so they don’t always get addressed. Thank you for providing all of these webinars. Your good sensibility is well heeded. Thank you for providing such value to our profession and helping us to become better assistants and better people. Your contributions are gratefully received. Thank you. Your webinars are always educational and inspire me continuously. Great point regarding lots of chatter during the program. May I suggest a webinar on working with a disorganized supervisors? Thank you for all Office Dynamics does and will do in the future. Thank you for the suggestion, Lisa. We’ll look into this topic. I enjoy all of the webinars that Office Dynamics offers and have enjoyed them all. I like listening to over a second time to make sure I get all the tips that your are providing. THANK YOU! Wonderful points to make others aware. 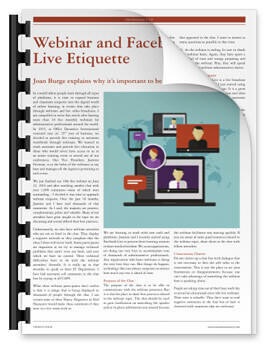 Thank you very much for sharing Webinar Etiquette with us! Unfortunately, some people in social media are so negative and mean-spirited w/their comments. They think they can “hide” by spreading their negativity, but it does affect their “brand”. I really appreciate what you and Jasmine do to make these webinars and conferences possible. Thanks again and keep up the great work! Excellent webinar. Thanks for speaking out on this.